Odds are you’ll put Three Billboards Outside Ebbing, Missouri on your must-see list after checking out the restricted (not safe for work or kids) trailer. Three Billboards comes from writer/director Martin McDonagh (In Bruges, Seven Psychopaths) and stars Frances McDormand, Woody Harrelson, Sam Rockwell, Abbie Cornish, Lucas Hedges, Željko Ivanek, Caleb Landry Jones, Clarke Peters, Samantha Weaving, John Hawkes, and Peter Dinklage. Fox Searchlight will release the dramedy in theaters later this year. 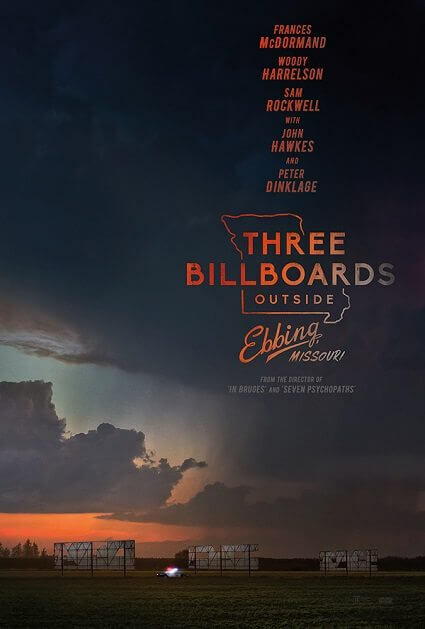 The Plot: Three Billboards Outside Ebbing, Missouri is a darkly comic drama from Academy Award winner Martin McDonagh. After months have passed without a culprit in her daughter’s murder case, Mildred Hayes (McDormand) makes a bold move, painting three signs leading into her town with a controversial message directed at William Willoughby (Harrelson), the town’s revered chief of police. When his second-in-command Officer Dixon (Rockwell), an immature mother’s boy with a penchant for violence, gets involved, the battle between Mildred and Ebbing’s law enforcement is only exacerbated.